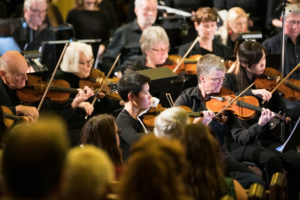 Orchestra Kingston gratefully accepts donations. We are a registered charity, and all donors will receive an official tax receipt. 1. By attending our concerts. You’ll hear great performances of appealing music, and tickets are very attractively priced. 2. Advertise in our Concert Programs, distributed to all ticket holders and orchestra members at each concert. Rates start from as little as $50. 3. Volunteer as an usher or ticket seller at our concerts. For more information about volunteering, please e-mail our General Manager (manager@orchestrakingston.ca).